Symon was born in Kenya, and qualified from the University of Nairobi, Kenya in 2007. 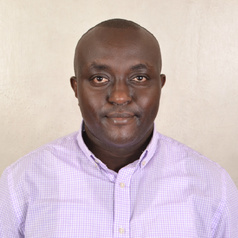 In 2009 he won a 6-months competitive joint research internship with KEMRI-Wellcome Trust Research Programme and Consortium for National Health Research in Kenya. As a Research Intern in these two institutions, he won a competitive bursary with MalariaGEN in Oxford UK to study genetics of acute symptomatic seizures in four African countries. In 2010 he was awarded the prestigious British Commonwealth Scholarship, under the auspice of the Wellcome Trust, to study MSc in Clinical Neurosciences of the Epilepsies at King’s College London in the UK, passing with a distinction in 2011. In 2013, he won the competitive Wellcome Trust Research Training Fellowship in Public Health and Tropical Medicine to fund his DPhil research studies at Nuffield Department of Medicine, University of Oxford, graduating in 2016. His DPhil project won the Nuffield Department of Medicine Graduate Prize of the medical sciences division. He has authored or co-authored around 25 peer-reviewed articles.